But the feeling of accomplishment after? The boost of confidence knowing that you already rocked a workout no matter what the day throws at you? Well, that’s just priceless. So if you’d like to start working out in the morning but haven’t quite figured out how to actually get out of bed when the alarm goes off, read on! 1. Envision waking up early, working out — and enjoying it. It may sound hippity-dippity, but if you can’t imagine yourself walking up early to work out and enjoying it, chances are you won’t do it. So for just a few minutes before bed, think about waking up to your alarm and feeling energized. Then, imagine getting ready and having a great workout. If you can do that regularly, it’ll only help you see yourself as someone who likes working out in the morning. And then you can make it a reality! 2. Ensure your morning is seamless and quick. 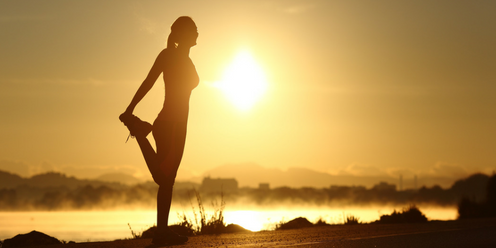 Working out in the morning has to be as painless as possible, and you want it to be as easy as possible to get out the door. So lay your workout clothes out the night before, have your bottle of water ready, brush your teeth, lace up your running shoes and get going. Do nothing but the bare minimum. Ideally, it should only take you 5 to 10 minutes to get ready. 3. Do what’s necessary to wake up. Set your alarm across the room so you have to get up and out of bed to turn it off. Then, once you’re up, flip on the lights. Turn on some fun music to get you pumped. And, of course, be sure to warm up before working out in the morning. March in place or do some jumping jacks — gotta get that blood pumping before you really get moving. 4. Leave yourself a note. While motivation for working out in the morning may be high when you go to bed, that enthusiasm might still be in a slumber when you wake up. So write down a few phrases that motivate you (check out Pinterest for ideas!) or the reasons why you want to start working out in the morning and tape it on your alarm clock. Then, before you decide to forgo your early morning workout, make yourself read it. It just might give you the boost you need to get you up! 5. Have a few bites to eat and water — and promise yourself a tasty breakfast when you get back.Eating too much before a workout isn’t great, but you will feel better if you eat something. I like half of a protein bar or half of a peanut-butter sandwich. Get something in your belly and then drink a cup or two of cold water. This will get your metabolism going, give your body fuel for working out in the morning and generally make you feel like more of a human. During your workout, plan what tasty and warm breakfast you’ll make when you’re done. I can’t tell you how many times the reward of hot coffee and oatmeal got me picking up my pace on a cold morning. 6. Make it a non-negotiable. While I like to hit the snooze button on the weekends, I have a strict no-snooze rule when it comes to early morning workout days. We’re not about hard and fast rules here on FBG, but when it comes to this one, getting up and out of bed is the hardest part of working out in the morning, so procrastinating doesn’t do anything but make it more likely that you’ll go back to bed. 7. Ease into working out in the morning. If you’re not used to working out in the morning, it’s probably not the best idea to try to do it five days in a row, especially if you’re getting up an hour or more earlier than you’re used to. Try gradually waking up earlier and earlier, and don’t be afraid to get up for early morning workouts every other day, just so that you have some sleep recovery time in the beginning. Yes, sleep experts recommend getting up and going to bed at the same time every day, but mentally, it’s far easier to get up early a few days a week than it is every day of the week. You feel me, ladies? 8. Don’t go it alone. Ya’ll know how much better is it to work out with a buddy? Well, the same rule applies to early morning workouts. Having a workout partner gives you someone to be accountable to AND — if you pick someone fun, which we recommend — it gives you someone to look forward to seeing. Yes, even at 5:30 a.m. Some of my very favorite workout memories are from early mornings at my gym, when everyone is too out of it to be anything but goofy and totally themselves. 9. Don’t beat yourself up. Truth be told, there is no “best” time of day to work out. So if exercising over lunch or during the evening feels better than working out in the morning, which feels like torture, who cares? Work out when it works for you. You’re the boss of your life, after all! A big Thank You to JenWalters for this great content!